You can book, change or cancel your oven repair appointment at any time online or over the phone. We’ll update you about your oven repair appointment via text, email or phone–whichever you prefer. Check that the power cord hasn’t been unplugged by mistake. Make sure that it’s receiving power: * Reset the oven’s circuit breaker by turning it to the off position, waiting 30 seconds, and then moving it back to the on position. * If your home has fuses instead of circuit breakers, make sure that the fuses are tightened securely and replace any that have blown. If they are not blown, unscrew the fuses that supply the oven, wait 30 seconds, and then screw them back in. Some ovens require the clock to be set in order to start—ensure your clock is set and then try turning it on again. Be sure you are waiting long enough—it can take from 15 to 20 minutes to heat the oven to 350°F. Keep the door closed during preheat to minimize the time required. If your oven has a hidden heat element (where the heating element is hidden under the floor of the oven), it may take longer to preheat. If you have any large items (like baking stones) in the oven, it will take longer to preheat. Remove any aluminum foil that is being used to line the oven racks or the bottom. Foil can have a significant impact on preheating time and may affect cooking performance. Wait for the oven to cool down completely after a self-clean cycle. The door can stay locked for up to an hour while it returns to a safe temperature. If it does not unlock after cooling down, try resetting the self-cycle: * Start the self-clean cycle again. * Wait until the lock motor stops running (about 15 seconds). * Cancel the self-clean cycle. * Wait for the lock motor to stop running again (another 15 seconds) and then try opening the door. Check the display and deactivate the lock-out feature if it is activated. To do this for most models: * Press and hold the Stop/Clear or Clear/Off button for 3 seconds. * A beep will sound and the lock-out indicator will flash until the door is completely unlocked. * Wait until the lock-out indicator stops flashing before trying to open the door so that you do not damage the latch. If it has a manual lock that is stuck in the locked position, wait until the oven is completely cool and then: * Put your hand on the door handle. * Press on the oven door firmly enough to release the tension. * While pressing on the door, move the lock to the unlocked position. NOTE: The lever should move easily—do NOT force it! The maximum allowed oven temperature is usually 550°F or 287°C. If you cannot select a temperature above 287°, it’s likely that your oven’s display controls are likely set to Celsius rather than Fahrenheit. Check your owner’s manual for instructions on changing the controls to Fahrenheit. Still having problems? Schedule a repair. 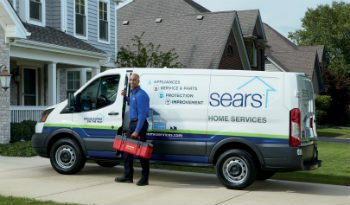 Whether you’re looking for oven maintenance, broken oven repair, or a brand new top-of-the-line oven, Sears Home Services can help. We’re your best, most-trusted option for fast, quick, and easy local service, repair, and maintenance of your oven or double oven. Whether your oven won’t turn on, your oven won’t stay hot, or the door simply won’t shut all the way, we’ll connect you to the best local oven service technicians in the business. Technicians that are highly trained, licensed, vetted, nearby, and guaranteed to help fix all of your oven needs. We have thousands of local technicians that are always “near me,” that can help you no matter what your appliance emergency.